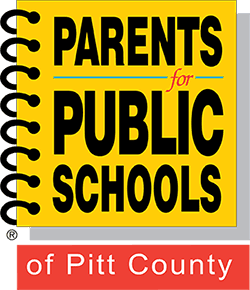 Parents for Public Schools of Pitt County – Welcome to our website! in strengthening public schools for every child. a high quality public education for each child. educating and mobilizing our community. This year's March in Raleigh to support public education is on May 1. Read more about the purpose of this annual event and how you can support public education and our teachers, whether in Raleigh or right here in Pitt County. Our friends at United Way of Pitt County would love to enroll your child in a free book per month if he or she is under the age of five. Please keep an eye out on our FB page in the next few days as we share ways that you can be engaged on May 1, be it from right here in Pitt County or if you decide to go to Raleigh. Thanks so much to Debra Baggett with Pitt County Schools for talking with us about school funding today!! Thanks to WNCT Maria Satira for joining our PEP class today as we learned about how the media can help us portray and advocate for public education.